Churchill may be the most quoted statesman ever. That of course also makes him a frequently misquoted figure. Mis-attribution even extends to quotes about him. I’ve had a subscription to The Economist for the better part of 30 years. 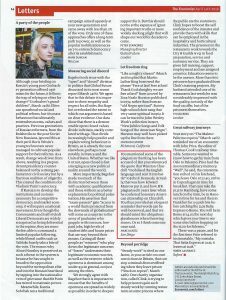 While no single news source is oracular or decisively authoritative, I find The Economist to be the most consistently thoughtful and relentlessly insightful periodical of which I’m aware. A lovely comparison. Just one problem: JFK did not put it thus. 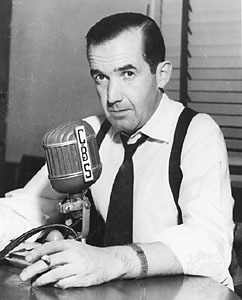 Edward R. Murrow did. 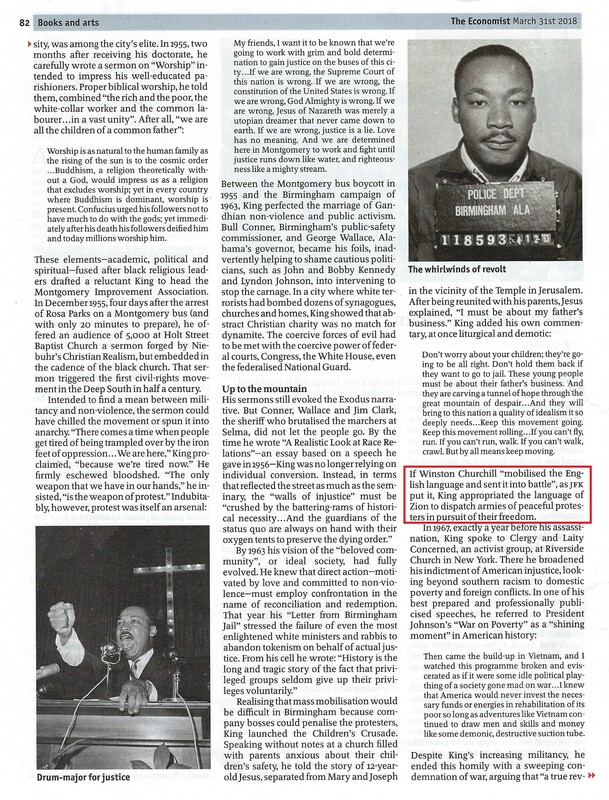 So an article that discussed misappropriation of language by a significant public figure was perpetuating misappropriation of language by a significant public figure. Since it was about Churchill, of course we chimed in. 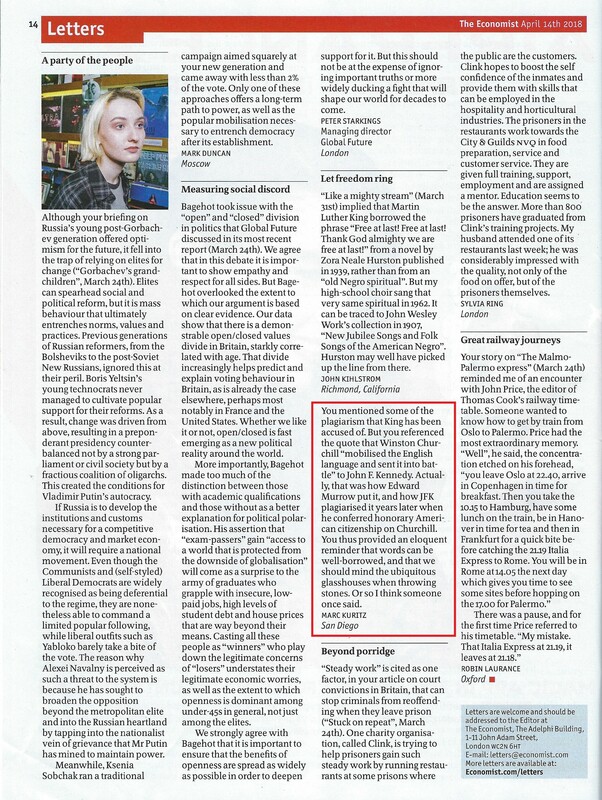 With delicious irony I noted an error of attribution in your piece “Like a mighty stream” in the Books and arts section of your March 31st2018 edition. You referenced some of the plagiarism of which Dr. King has been accused. 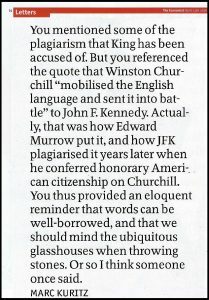 Then, in the same piece, you reference how “as JFK put it”, Winston Churchill “mobilized the English language and sent it into battle”. 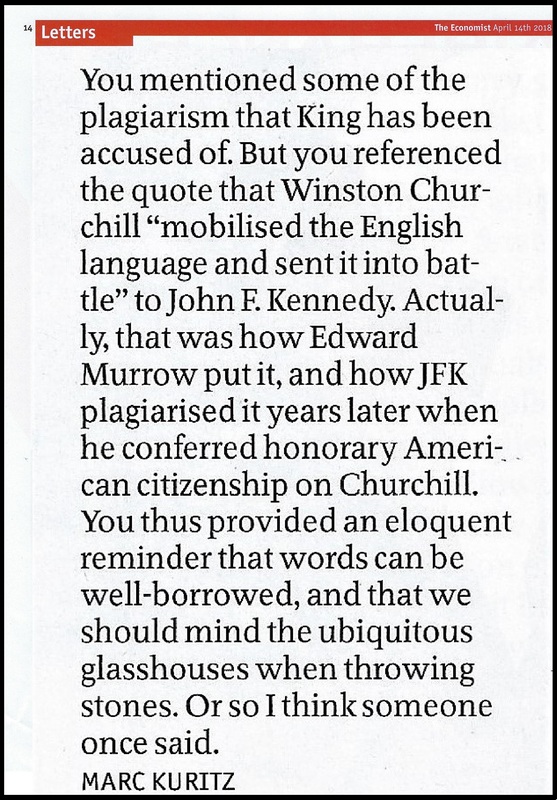 Actually, that was how Edward R. Murrow put it, and how JFK plagiarized it when he conferred honorary U.S. citizenship on Churchill years later. Though you may not have meant it thus, you provided an eloquent reminder that words can be well-borrowed, and that we should mind the ubiquitous glass houses when throwing stones. Or so I think someone once said. You mentioned some of the plagiarism that King has been accused of. 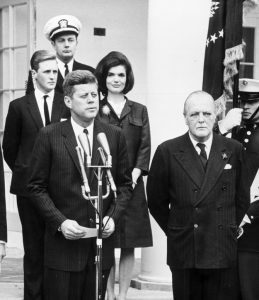 But you referenced the quote that Winston Churchill “mobilized the English language and sent it into battle” to John F. Kennedy. Actually, that was how Edward Murrow put it, and how JFK plagiarized it years later when he conferred honorary American citizenship on Churchill. You thus provided an eloquent reminder that words can e well-borrowed, and that we should mind the ubiquitous glasshouses when throwing stones. Or so I think someone once said. Which brings us back to the quotable guy the quote was about. Quoting Churchill can be fraught. The internet is full of mangled and dubious Churchill quotations. 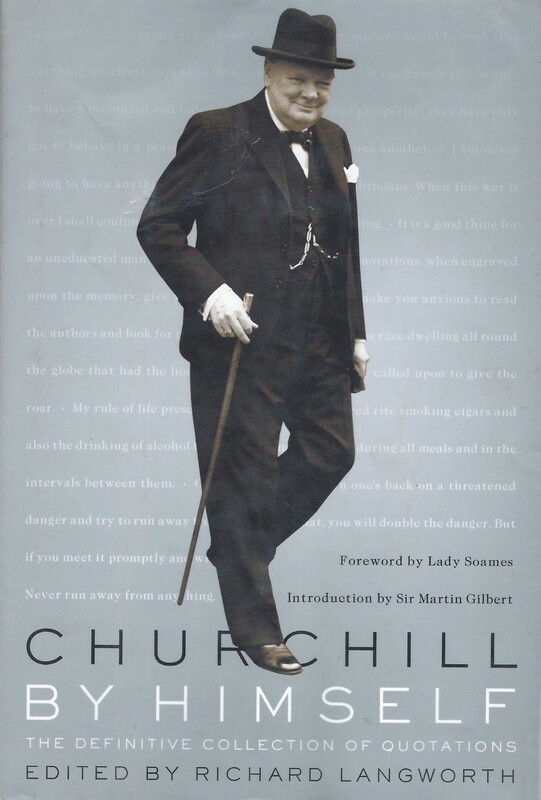 When quoting Churchill, we strongly recommend Richard Langworth’s most excellent book Churchill By Himself: The Definitive Collection of Quotations. 627 pages of well-organized, well-documented, well-indexed Churchill quotes that can be relied upon for veracity. © 2019 Churchill Book Collector. All rights reserved.